Home Security Cameras at Costco: What Are My Options Here? For new homeowners, there can be nothing more frustrating than trying to figure out what exactly to do in regards to home security. Home security is obviously incredibly important, yet so few people take it seriously and even fewer are willing to really invest in the concept. According to reports, only 17% of homeowners in the United States have a security system in their home. This isn’t just unacceptable, it’s a bad idea. While burglaries aren’t exactly commonplace, they are not rare either. Thanks to companies like Costco, home security camera systems are more affordable than ever — and that’ll be the topic of our discussion. Let’s talk about which camera security systems available from Costco are the best of the best. For people shopping around online in order to find a home security system, the task may seem Herculean. There are countless companies all trying to sell their products and it can feel impossible to sort through the different options available. How does a homeowner narrow down their search in such an important field? According to research done by the National Crime Prevention Association, apartments are an incredible 85% more likely to be broken into than a traditional home. This means that renters ALSO need to be taking their home security seriously! Well, the key to finding the right system is to narrow down exactly what the search is all about. While it is true that there are countless security systems available, even when looking at just the Costco catalog, researchers can narrow down their search with a few key questions. Let’s take a look at these key questions in order to help find the right Costco home security cameras for the job. Answer the following questions before moving forward in our discussion. How many cameras will I need in order to properly cover my entire home? Will I be using these cameras outdoors as well as indoors? Do I want night vision cameras? How will my cameras connect to the network in my home? WiFi? Bluetooth? With these questions firmly answered, move on to our next session in order to look closely at the top options available on the Costco marketplace. After extensive research, we’ve managed to break down the top security systems at Costco into three different products. Listed below are the key benefits that each system can offer. 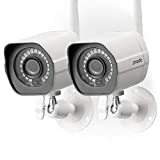 Arlo Pro Smart Home HD Security Camera 3-Pack – This wireless system is great for smaller homes and apartments. With night vision up to 25 feet away and a completely wireless setup, this system offers extensive coverage. AvertX 16-Channel 8TBB HDD With 2 4K Domes & 6 4MP Domes – This is an absolute juggernaut of a security system. With ten total cameras, two of which are operating at 4K video quality, homeowners can network an entire building to their satisfaction. All of the footage is captured to a single, gigantic 8TB hard drive. Q-See 16-Channel 4K NVR, 12-4K Bullet Cameras – This elaborate system offers a dozen bullet cameras that are equipped with color night vision and 4K recording quality. An elaborate mobile application allows homeowners to monitor their system even while away. While companies like Costco have a wide variety of different home security systems available, they aren’t the final conversation on the topic. In fact, for homeowners looking to acquire a professional home security system the answer might be found in another company — Protect America. Established in 1992, Protect America has quickly become one of the biggest direct-to-consumer home security companies in the nation. They offer free estimates, 24/7 professionally monitored security systems, and plans as low as $30 per month. Did we mention that Protect America is also willing to price match any other deal? For homeowners looking to add professional monitoring services to their home, give Protect America a call.